Although you might not be under as much pressure as you are when capturing getting ready moments and portraits, photographing the wedding ceremony and reception comes with its own set of challenges. 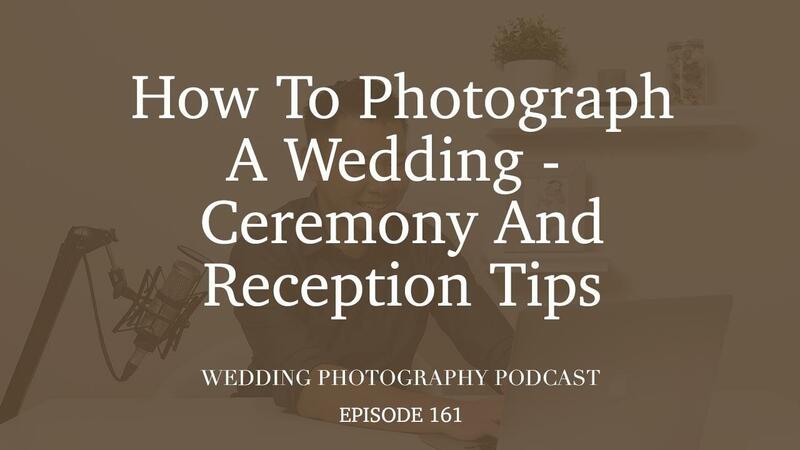 In the fourth episode of this five-part podcast series “How To Photograph A Wedding”, we’ll focus on tips for shooting ceremonies and receptions. The good news is that you don’t have to offer much guidance to your couples or work under the time pressure of capturing getting ready moments. But that being said, you also can’t do-over photos if you don’t get them quite right, with just one chance to come away with a beautiful portfolio of images. We’ll chat about some of the challenges of photographing wedding ceremonies and receptions, including the restrictions on shooting angles, harsh or low lighting conditions, and small spaces. Perhaps the schedule is already running late and you don’t feel comfortable asking the couple if they want you to stay and do overtime. Or maybe you’re feeling uncertain about what’s going to happen next during a cultural wedding. Like most things, it comes down to being prepared and discussing all of these factors with your couples before their special day. Know the order of events and what’s going to happen, and have a game plan with your second shooter so you know who’ll cover what. We’ll also chat about the importance of working with two camera bodies so you don't have to constantly change lenses, as well as checking your settings on a regular basis to ensure the photos you’re capturing are up to scratch.